If you'd like to contact us to book or have other enquiries, please use the form below or email us directly at info@budleighmvc.co.uk. 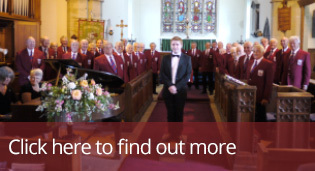 Why book Budleigh MVC for your event? We are a good means of raising funds for your charity and we would like to help you make full use of this opportunity. Selection of and payment for the venue is your responsibility but it must be capable of comfortably accommodating a choir of up to 60 and seat an audience of at least 150. Our Choir Manager will be happy to provide advice in the planning stages and if the venue is new to us he may wish to visit the premises to determine or confirm its suitability. Interested? Then please contact us by filling in our contact form and our Secretary will provide you with the full list of our Guidelines and Conditions.